1887 marked the fiftieth year since Queen Victoria’s ascension and a jubilee was planned to celebrate this remarkable date in history. In those fifty years, Great Britain had grown into a vast Empire, a top manufacturer and exporter of goods, a social arbiter, an envied nation, and at the top was crowned the greatest monarch of the age: Queen Victoria. The advent of the jubilee rejuvenated Victoria’s public image, which had taken a beating due to her rabid seclusion in the two decades after the Prince Consort’s death, and the subsequent popularity of the Prince of Wales. The date for the jubilee celebration was set for the 20th of June, exact date of her accession, to which dozens of royals and heads of state were invited to partake in a lavish banquet at Buckingham Palace. “Jubilee Day, the 21st of June, was a day ever to be remembered by those who were privileged to be in London, and to witness the royal progress to Westminster Abbey. The day was observed as a national holiday, and fortunately was one of perfect sunshine. Houses and streets were profusely decorated, and the demonstrations of personal affection for the Queen were universal. Tens of thousands of persons lined the thoroughfares, especially along Piccadilly, Pall Mall, Whitehall, and Parliament Street. The gorgeous cavalcade excited intense interest; the brilliant group consisting of the Prince of Wales, the Crown Prince of Germany, and the Crown Prince of Austria, being singled out for special admiration. Whenever Her Majesty appeared, however, she was the cynosure of all eyes. She drove in State, accompanied by the members of the royal family, and by the foreign potentates and princes who were her guests. The Thanksgiving Service in Westminster Abbey was most impressive. The interior of the Abbey had been completely transformed, so as to afford the largest possible amount of sitting accommodation. An eyewitness of the ceremony thus described the scene in the Abbey, and the order of the service: “King Henry VII.’s Chapel had been shut off, and not a single monument was to be seen anywhere. The Abbey was more like Cologne Cathedral than the Abbey Englishmen know and love so well. At either end—that is to say, above the altar and at the western end of the choir—were two immense galleries crowded with people. On either side of the nave, too, there were galleries filled with naval and military officers and their wives. On the floor in the nave were the Judges, the Lord Mayor, the Aldermen and Common Councilors, and a host of distinguished personages. The Beefeaters kept the line of route here,but they had little to do, for the arrangements were too admirable to make over-crowding possible. 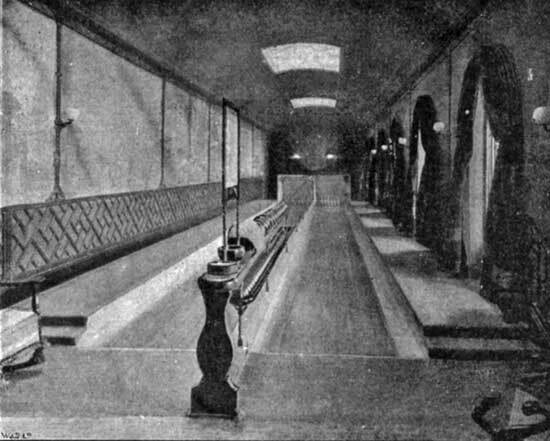 The choir was reserved for minor potentates and for the attendants of the kings and princes, who were seated within the rails of the sacrarium. Between the sacrarium and the choir was thje daiis, a wide structure covered with red baize, with the coronation chair in the centre. On the right of the chair the princes who accompanied Her Majesty were to sit, while the princesses were on the left. On the altar was a splendid gold alms-dish and four large bouquets of white lilies. On one side of the dais were members of the House of Lords; on the other, members of the House of Commons, while above the peers was a diplomatic gallery, where a most dazzling exhibition of classes and orders could be seen. The Indians formed a magnificent group, blazing in rose diamonds. There were the Thakur Sahibs of Gomdal, of Lieuri and of Moroi, the Maharajah of Kuch Behar, and the Eao of Kutch. Above all was the Maharajah Holkar of Indore, who seemed to be a mass of emeralds and brilliant Almost at the same time the Sultaneh of Persia, Prince Komatsu e Japan, and other Eastern princes were conducted to their places in tin sacrarium, where also the Queen of Hawaii was allowed to have a place. She wore a large number of Hawaiian orders. Then there was a lull until about twelve, when Dr. Bridge struck up Lemmens’ ‘Marche Pontificate,’ to welcome the foreign royalties. The Queen herself had selected this piece. It was a splendid procession. The King of Saxony, who is blind, was led up the aisle by the Crown Prince of Austria and the Grand Duchess of Mecklenburg-Strelitz. Since our Queen assumed the globe, the sceptre. Crowning year of her Jubilee. All is gracious, gentle, great and queenly. Of this year of her Jubilee. Sorrowing with the sorrows of the lowest! And this year of her Jubilee. Even her Grandsire’s fifty half forgotten. Fifty years of ever-broadening Commerce! Fifty years of ever-brightening Science! Fifty years of ever-widening Empire! All your voices in unison. Are there thunders moaning in the distance? Are there spectres moving in the darkness? Dawns into the Jubilee of the Ages. Less opulent than Buckingham Palace, less iconic than Windsor Castle, and definitely less bombastic than Balmoral, the royal residence of Sandringham House in Norfolk was built for privacy and simplicity. 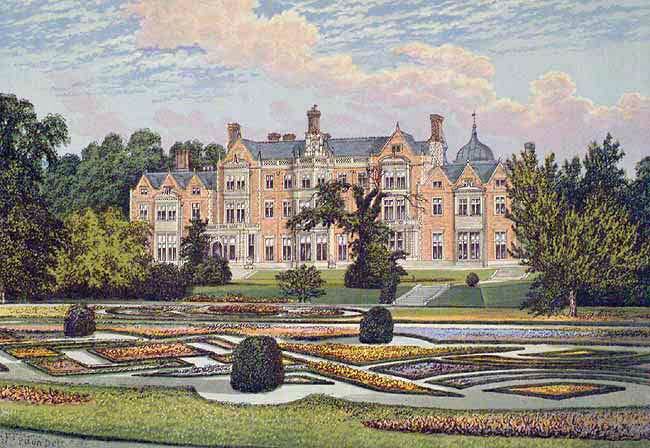 Here, on his own country estate King Edward VII could relax from the formalities of his rank, he could romp with his family and close friends, and he had full control over the workings of the household. Though as King, he did not have as many opportunities to travel to Sandringham as he had when he was merely the Prince of Wales, Edward more than made up for his absence during Christmastime. At Sandringham one could expect the holiday to be celebrated in a good old-fashioned style, “uniting all the mighty feasting, the sports and merriment, the decorative use of flowers and evergreens which trace back through centuries of our history past the Christian story into Druidical mists, to the pretty customs of the Christmas tree, with its adornment of tinsel, flags, crackers, and flaring tapers, and the midnight invocation of Santa Claus, which were brought over from Germany by the Prince Consort.” The guests consisted only of members of the Royal Family, who purchased their presents in advance in London, or selected items sent to Sandringham by the most fashionable tradesmen and department stores. 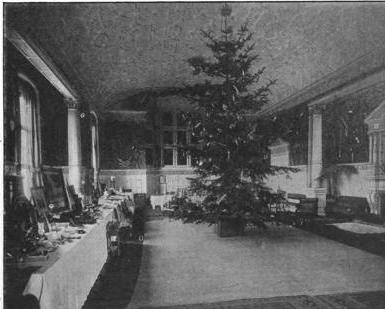 In the ballroom was the great Christmas tree upon which hung the presents for King Edward’s grandchildren and every other member of the household, down to the humblest governess. On Christmas Eve, the King and Queen distributed joints of beef and other substantial foodstuffs to the labourers, workmen, and cottagers on the Sandringham Estate. In addition, gifts such as warm garments, toys, and other useful items were sent around to the cottages. On Christmas morning, the adults were wakened by the State Piper, who played his bagpipe as he walked around the house. Of course the children were awake and full of glee, and there was much excitement when the adults went down for breakfast in the Dining Saloon. The presents were passed around as everyone ate–or tried to eat–breakfast, and to that purchased by the family members for one another at Sandringham were the piles and piles of gifts posted or sent by rail from the many relatives abroad. 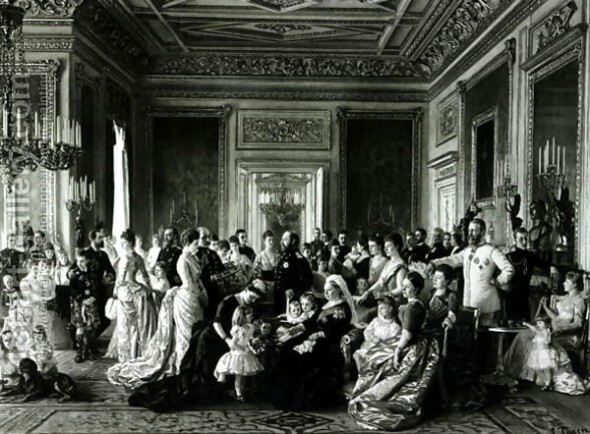 After this, everyone tramped from room to room, examining the decorations of holly and mistletoe put up by Queen Alexandra, her daughters, and members of the household, and then went upstairs to dress for church. The King and Queen led the way on foot across the park to the church of St. Mary Magdalene, which was also decorated by Alexandra. The Royal Family sat within the chancel, and the rest of the church was filled with “the suite and servants, some of the children of the Royal Schools, and a few visitors”. The sermon, in accordance with the King’s wishes, never exceeded twenty minutes, and once the service ended, the congregation rose and remained standing until the whole of the Royal Family had departed. The children were left to eat luncheon (a concession to the holiday was the flambeed pudding! ), while the adults spent the afternoon out of doors, motoring, driving, ice-skating, walking, riding, and visiting the kennels. After tea, the children were herded downstairs and into the saloon, where their presents hung from a blazing Christmas tree. Everyone spent a few hours in games with the junior members of the Royal Family until they were tired out and sent to bed. Later that evening, everyone who pulled a ticket were summoned to the ballroom, where a table circled the Christmas tree was laden with presents. Courtiers, tenants, and servants received gifts from the King and Queen, usually comprising of “handsomely-bound books, articles of jewelry, etc from the King, and books, art pottery, art needlework, wood carving and silk dresses from the Queen–the latter being chosen as presents to the upper servants.” Edward delighted in this activity, and Alexandra threw herself into the spirit of the day, flinging packets of crackers and sweets to queue of people. The crowning ceremony of the day was Christmas dinner. At 8:45 Sandringham Time, the guests and all members of the Household commanded to dine with their Majesties assembled in a large drawing room about fifteen minutes before the appointed time to settle who was to take whom in to dinner. Three minutes before the clock chimed, everyone passed through the drawing room two by two, in order of precedence, and took their seats at the series of oval tables laid in the Grand Dining Saloon. Servants clad in splendid liveries of scarlet coats and waistcoats trimmed with gold braid, wearing gold stocks in place of collars, white satin breeches, stockings, and shoes stood at attention, and there were special footmen immediately behind the chairs of the King and Queen, to whom the regular footmen brought dishes from which these special footmen served Their Majesties. The tables were laden with gold and silver plate, rare flowers, and a pure white china service decorated with the Royal Arms and the Garter. The menu comprised of barons of beef, cygnets, turkeys, plum puddings, mince pies, etc, of which everyone had to consume within the hour allotted to dinner. At the end of dinner, the Queen signaled the most exalted guest and everyone rose as the ladies retired to the drawing rooms. The King and the gentlemen followed suit in twenty minutes (Edward, when Prince of Wales, found dawdling over port and cigars with men tiresome, and shortened that postprandial interlude drastically), after which there was either a dance or a Command Performance of that season’s most fashionable play or musical comedy, or perhaps simple pleasures such as bridge, parlor games, music, or a turn in the American-style bowling alley. This intimate Christmas celebration lasted into the wee hours of the night, and the following day was when the servants’ had their Christmas dinner, where certain favored guests were issued invitations, and they and the King and Queen joined the merriment belowstairs. The next few days after this were usually devoted to a shoot. Four to six crack shots were invited to Sandringham to enjoy what was considered the best shooting in England. All farm machinery was at a standstill so as not to disturb the birds, and farmhands with blue and red flags, attired in smocks and with red bands around their hats, were taken to their places by the gamekeepers. Game carts were sent to the places where the firing was likely to the “hottest,” and when all was ready, the vehicles carrying the King and his guests rumbled across the estate. The guns were out all morning, booming and crackling across the sky. At one pm, the ladies were expected to grace the luncheon tent with their presence, where everyone dined on plain and simple dishes like Irish stew, roast beef and Yorkshire pudding, or boiled beef and batter pudding. 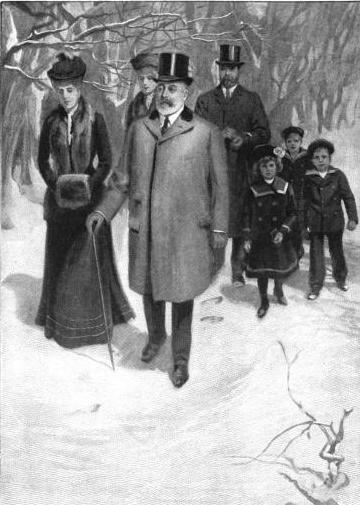 By the close of December, the celebrations at Sandringham had ended; however, King Edward and Queen Alexandra always extended their holidays with their annual New Year’s house party hosted by the Duke and Duchess of Devonshire at Chatsworth, where they enjoyed the same degree of intimacy and privacy as at Sandringham. 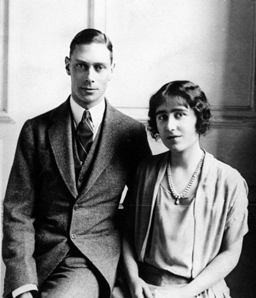 Though his reign is firmly of the mid-twentieth century, George VI was an Edwardian. The second son of the Duke and Duchess of York (later George V and Queen Mary), he had the misfortune of being born in 1895 on the very day the Prince Consort died thirty-four years beforehand. His great-grandmother, Queen Victoria was incredibly distressed by the news, and the family huddled together before finding the proper solution: name the new royal baby “Albert” (he was formally baptized Albert Frederick Arthur George). For some reason, this mollified the Queen, though the name was not very special by that time, what with many members of the royal family–both male and female–having some variant of her beloved’s name in their own, and with the number of aristocratic babies named after their godfather (the Prince of Wales, later Edward VII–another Bertie), England was practically awash in Alberts! But this was yet another “poor Bertie,” since he suffered from ill health, a stammer, and knock knees, was easily frightened, and apt to cry on the spot. This was understandable, since his father was rather cold and brusque with his children, and his mother could only do so much to give them the necessary attention without raising his ire. 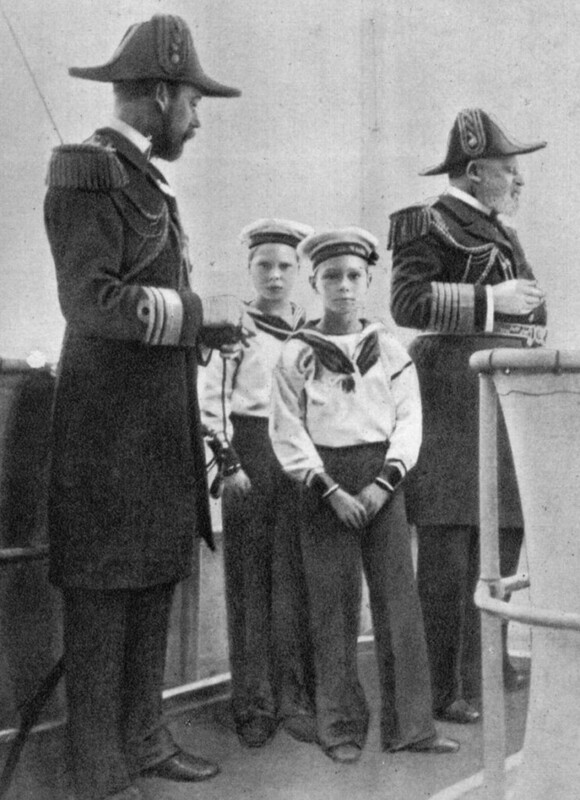 At fourteen, Bertie followed in his father’s footsteps, now the Prince of Wales (George V), with enrollment in the Royal Naval College, Osborne, as a cadet. He didn’t shine there either, but was nonetheless propelled to the Royal Naval College, Dartmouth. By the outbreak of WWI, he was 19 and commissioned as a midshipman, but he did his duty and made his country proud during the Battle of Jutland (1916), where he was mentioned in dispatches for his action as a turret officer aboard HMS Collingwood. His ill health got the best of him again, and he didn’t see action again. Fortunately, he was given important duties with the newly-formed Royal Air Force (RAF), and he was appointed Officer Commanding Number 4 Squadron of the Boys’ Wing at Cranwell. After the end of the war, Bertie, made His Royal Highness The Duke of York in 1920, took on royal duties, representing his father on tours of the country. His particular focus on coal mining, railways, and earned him the nickname “Industrial Prince”, but despite the shyness born from his stammer, he possessed a genuine interest in working conditions and the poor, and he became President of the Industrial Welfare Society and founded a series of annual summer camps between 1921 and 1939, which brought together boys from different social backgrounds. Around this time he met Lady Elizabeth Bowes-Lyon who, despite being a descendant from Robert the Bruce and Henry VII, was considered a commoner! Fearing the burdens of royalty, Lady Elizabeth rejected his proposal twice, but after a long courtship, she finally consented to become his wife. Their wedding in 1923 was the event of the year, and the new Duchess of York inadvertently began a tradition when, she spontaneously laid her bouquet at the Tomb of the Unknown Warrior on her way into Westminster Abbey. 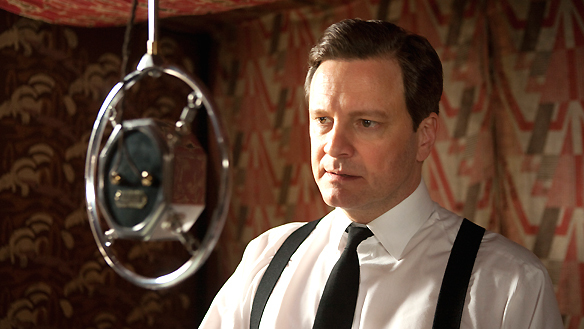 The rest of the story is, as they say, history–or better yet, gloriously captured in the Academy Award winning drama, The King’s Speech.